The Pony Club Polocrosse Championships took place at Cholmondeley Castle on the 18th and 19th of August, as part of the overall Pony Club Championships. Despite a few heavy rain showers causing the pitches to cut up quite badly over the two days of play, there was some outstanding polocrosse on display from players of all ages and abilities. It was also brilliant to see a number of new players and Pony Clubs taking part, with novice grades at all three levels of competition (Seniors, Juniors and Minis) for the first time in a number of years. The overall standard of play in Pony Club polocrosse has improved greatly over the last few years and this year it continued to be very high. 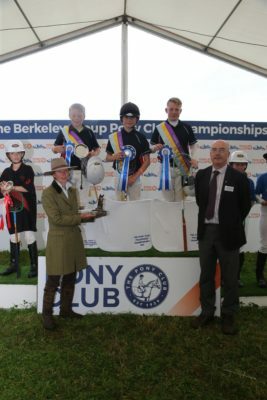 The Home Nations competition in July had already shown just how good some of the Pony Club’s up and coming polocrosse players are and the Championships gave them another chance to show off their skills. In the Charles Mason Senior grade there was a win for the always strong North Warwickshire, as the team of Katie Loutisou, Amy Harper and Danny Woodward overcame the Percy Hunt team of Sam Chrisp, Rebecca Alderson and Jack Chrisp in a hard fought final match on Saturday. Both teams had managed to overcome the LLangeinor Hunt and the mixed Stoneleigh team and for the first couple of chukkas it was a very even match, as the cut up pitch made bounces and pick ups hard and kept the score relatively low. However, North Warwickshire just started to pull away a bit towards the end of the second chukka and then added to their lead in the third to win by 8 goals to 3. In the Novice Seniors it was a Mixed team of Jack Page (Essex Farmers), Hollie Baker (Essex Hunt North) and Jess Alderson (Rockwood Harriers) who won the day, with an Area 8 team in second place and a mixed St David’s & District and Tanatside team in third place. Given that nearly all the players in this grade were new to the sport in the last year it was great to see how high a standard of play there was and how quickly they had all come on; a credit to the increasingly formalised and high standard of polocrosse coaching that now exists within the Pony Club and the UK generally. In the Stoneleigh Open Juniors it was again the North Warwickshire team that won the day. The experienced tri of Theo Cornforth, Fin Bristow and Tegan Bristow defeated all their opponents over the weekend, though they had to fight hard to get past the two mixed teams from the Grafton & Percy Hunts and the North Down & Croome Hunt. Wins in both the Open Seniors and the Open Juniors meant the North Warwickshire also lifted the prestigious Malden Championships Trophy, as they have done for the last few years. The Malden Championships had previously been run as a separate class but the decision was taken this year that it would instead be awarded to the Branch, Centre or Area that did best in both the Open Seniors and Open Juniors. This was done in order to stop teams having to choose whether to enter the Malden Championships itself or the individual sectional competitions and the new format seemed to work well. This year there was also an Intermediate Juniors grade, as the number of entries and range of abilities in the Junior class was so great. The Intermediate Juniors was won by Over Dalkeith Stables team of Luca Puccianti, Isla Hood and Megan MacColl but they had to rely on goal difference to do it, after they lost their opening match to the Warwickshire Hunt by 7 goals to 8. After that they managed to defeat the Area 5 team by 6 goals to 5 and the United Pack by 13 goals to 6. The United Pack managed to get second spot from the Warwickshire Hunt on the basis of goals for, after both teams were even on goal difference. The Novice Juniors again saw a lot of new players taking part and it ended with a win for the Llangeinor Hunt Branch team consisting of Abi Phillips, Malkia Beadle and Jaz Cuggy, with Over Dalkeith Stables in second spot, a combined David Davies & Tanatside team in third and the United Pack in fourth. The Minis grade (12 years and Under) was played as a Cup and Plate competition, with the grade being split into Brookes Open Minis and Novice Minis after the first match. The standard in this grade was impressively high; with the players and their ponies demonstrating skills that you would not have seen just a couple of years ago in players of this age. The final match in the Brookes Open Minis between the United Pack (Charlie Evans, Jessica Clark and Philip Watney) and the Warwickshire Hunt (Will Holland, Georgie Wasdell and Harriet Wasdell) was incredibly close and an absolutely brilliant to the end of the competition. It was the United Pack who just edged it by 9 goals to 8 at the very end, with some particularly good link up play between Philip Watney at number 3 and Charlie Evans at number 1 in the last chukka. Over Dalkeith Stables just overcame Area 8 by 6 goals to 4 in the 3rd/ 4th play off. In the Novice Minis there was a win for the United Pack as well, as Emma Scuffham, Niamh Morris and Alice Leeke overcame a combined Rockwood Harriers & North Warwickshire team, consisting of Harry Horton-Barr, Daisy Whittell and Phoebe Sykes, in the final. Another combined team of the Ledbury Hunt & North Warwickshire was in third place, with Area 8 in fourth spot. There was two sportsmanship awards, Best Sportsman went to Theo Owen of the St David’s and District and Daisy Whittell of the Rockwod Harriers won best Sportswoman. Overall it was a brilliant two days of competition and another great sign of the growing strength of Pony Club polocrosse, both in terms of the quality of play and the number of new players involved, as the game becomes more popular again all around the country with Pony Club members.